James Abram Garfield was the second US president to die by an assassin’s bullet and his was also the second shortest time in office. A contented senator, Garfield found himself his party’s nominee for president at the Republican National Convention and he reluctantly accepted. After his inauguration he spent much of the next few months being accosted by people wanting jobs. Bizarrely, in those days the president was responsible for the majority of the hirings in his administration, since everyone — from cabinet to clerks — was summarily sacked when the previous incumbent left office. One of the people turned down for a job was a mentally unbalanced, 37-year-old religious fanatic called Charles Julius Guiteau. He believed that he had been responsible for Garfield’s election and thought that an appointment as consul general in Paris would be a fitting reward for his efforts. He wrote a meandering letter to Garfield seeking his just desserts and then travelled to Washington DC. Despite the assassination of President Lincoln just 16 years previously, security at the White House was almost non-existent and Guiteau got to see the president. He handed him another copy of his letter, with “Paris consulship” written on the cover. Frustrated that he was not immediately appointed, Guiteau took to hanging around the White House before his odd behaviour finally got him banned. 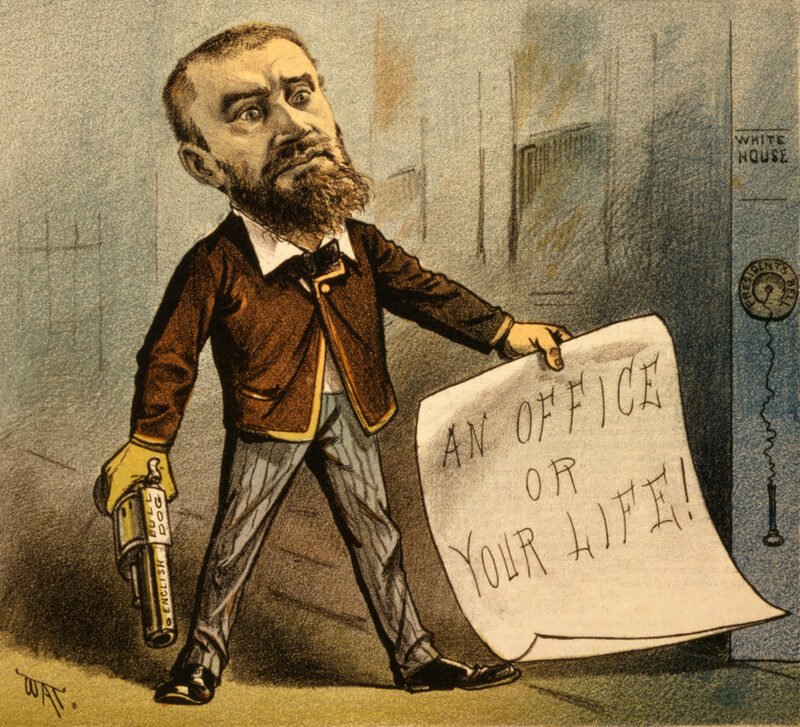 Guiteau became convinced that Garfield was personally blocking his appointment and he began to stalk the new chief executive. At 9.30am on 2 July 1881 Guiteau seized his opportunity and shot Garfield as he walked through the Sixth Street Station of the Baltimore and Potomac Railroad. One bullet went through the president’s shoulder and exited his back while a second lodged in his chest. A policeman grabbed Guiteau, while the crowd wanted to lynch him. Garfield was taken to the White House to recover. Alexander Graham Bell invented a medical detector to try and find the bullet but the metal frame of the bed Garfield was laid on hampered his efforts. The president seemed to recover and was taken to Elberon, New Jersey to further recuperate. On 19 September 1881 at 10.35pm Garfield died of a massive heart attack, exactly two months after his 50th birthday. It is generally believed that if the medical attention he received had been competent, Garfield would have survived the shooting. Guiteau’s lawyers entered a plea of insanity but it was rejected and he was hanged on 30 June 1882 at the Washington Asylum and Jail. As he went to the gallows he recited a poem he had written while awaiting execution. It was called I am Going to the Lordy.